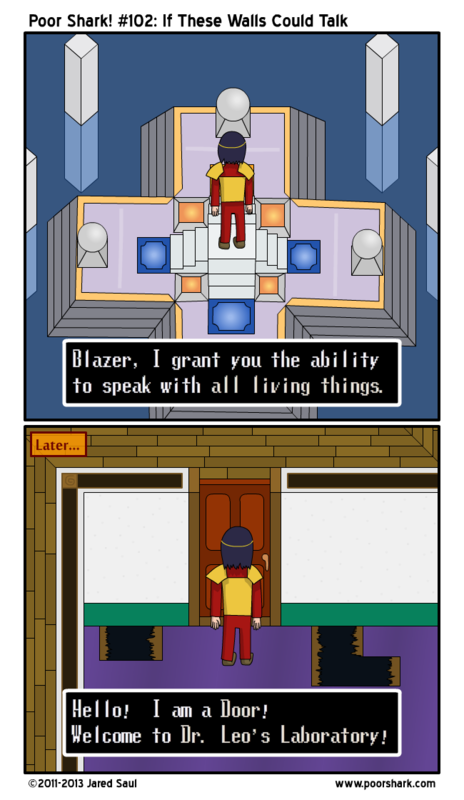 Another Soul Blazer comic, because we beat World 2 on Saturday. Soul Blazer’s storyline explains that the so-called King of Evil (apparently named Deathtoll, not Ganon) struck a deal with a corrupt government official and basically abducted all living creatures in exchange for gold. I can’t wait until we get to World 5, because then I get to start saving doors and dressers and staircases and models of town and all other sorts of inanimate objects. Why they were missing is anyone’s guess, but since you can also talk to them, it sounds like maybe this is something out of Toy Story instead. WHOOPS I AM LOCKED BRING ME MY KEY, WOULD YOU?